A game with a twist! When up and down (and left and right) changes with the twist of your wrist, the game takes on a whole other dimension! 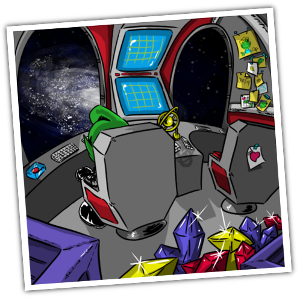 Blip was returning home from a successful crystal collection expedition when his spaceship LIZA was hit by an asteroid. The collision damaged LIZA's rear hatch and all the crystals and crates were lost, caught in the gravity field of a strange planet. These crystals come in four colors and are the power source of Blip's people. 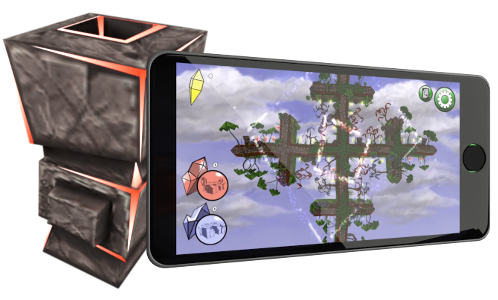 Your task is to control Blip and collect as many crystals as possible on each level. The stronger the crystal is, the more points you get at the end of each level. Yellow crystals will give you 1 point each while blue and red crystals gives you 2 and 5 points respectively. Each level also contains one or two crates with a powerful green crystal inside. You must find these crates to power up the portal which allows you to enter the next level. You also get 10 points for finding a green crystal. To accomplish this, you will need to use some or all of Blip's many gadgets. But be mindful, these gadgets may use the very crystals you're collecting and thus affect your total score at the end of the level. Blip's trusty Grabbaton Hook is his most used gadget. It helps him jump over chasms and swing over edges. He can also use it to destroy rocks and crates to find out what's inside them. The best part is that the Grabbaton Hook does not use any crystals at all! Stay grounded with Blip's Grabbaton Boots! When Blip uses them he stays in place even when you rotate your device to change gravity direction. Objects like bridges are still affected though. The Grabbaton Boots uses 1 blue crystal each time you start them up. So use them wisely! Sometimes there seems to be nowhere to go. But Blip has got a trick for just those occations. With his AntiGrav Grabbaton Boots Blip can fly a short distance and latch on to the surface above him. These boots combine the ability to fly with the Grabbaton Boots ability to stay in place. They draw much power though and therefore needs a red crystal to use. Teleporters come in different colors, and to teleport you, they use a crystal of the same color. Use the map mode to see where teleporters lead to. Map mode is also an excellent tool to use for planning your route through the level. A whole new world with 15 new exciting levels are in the making. With brand new challanges and puzzles! And it will be available for free with an automatic update!